With the Club’s first competitive home games beginning this Saturday, let’s take a look at the history of this fantastic new facility and of the surrounding area. Set in a tranquil, rural setting ‘Coplicks’ is today a major sporting asset for Gold Coast’s southern suburbs, also home to the Tallebudgera Valley Soccer Club and the Twin City Baseball Club, in the southern sections of the park. The expansion of the sports park to now include the home of Gold Coast United was made possible by the City of Gold Coast’s purchase of the Burleigh Palms golf course in 2012. The development of the facilities began in 2015 and was helped by a funding commitment from the State Government. 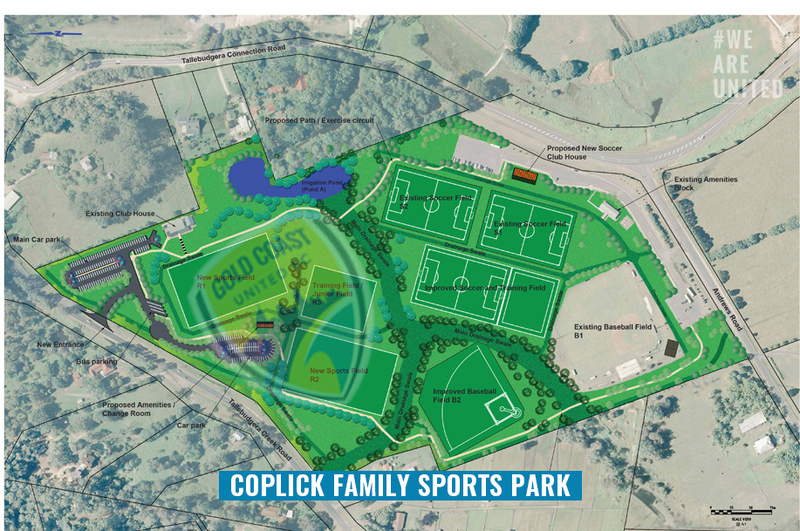 The sports park takes its name from the Coplick family, prominent local pioneers. The Koplicks wooden bridge that first connected Old Coach Road and the Tallebudgera village has been updated but still stands in its original location not far from the southern fields. The traditional owners of the area were the Tul-gi-gin people and it’s believed that Tallebudgera, an Aboriginal word, is said to mean good fish, derived from talle meaning fish and budgerie meaning good. The village of Tallebudgera was originally known as Maybree which was the name of a tree that grew locally. Tallebudgera’s location was along the main stock route between Queensland and New South Wales (The Coach Road), which saw it become a convenient stop and changeover point for Cobb & Co. coaches. To serve the coach road traffic and the wider farming community, a small village began to develop near the intersection of the old Coach Road (now Tallebudgera Connection Road) and Trees Road. The historic Post Office remains from that time, a short distance up Trees Road from the current Tallebudgera shops, landmarked by the recently restored Man on the Bike which was first erected in the early 1970’s. An exciting time lays ahead with Gold Coast United eager to stamp its mark on the area. The first competitive matches at ‘Coplicks’ sees the NPL Boys take on Eastern Suburbs this Saturday from 9am. The first senior home game is scheduled for the following Saturday, the 9th of February, when the Men’s side take on the reigning National Premier Leagues Queensland Premiers & Champions, Lions FC.